The Virginia man whose footage of a car plowing into anti-racist protesters in Charlottesville horrified the nation filed a defamation lawsuit Tuesday against infamous "Infowars" host Alex Jones, former Congressman Allen West and others. The man, Brennan Gilmore, who is being represented by Georgetown Law’s Civil Rights Clinic, claims in a suit filed in a Virginia federal court that Jones and others smeared him as a "shill" for the "deep state" and then mobilized followers to launch a campaign of harassment that continues to this day. "Today, I'm asking a court to hold them responsible for the personal and professional damage their lies have caused me, and, more importantly, to deter them from repeating this dangerous pattern of defamation and intimidation," Gilmore said in a statement. There was no immediate response to emails for comment that were sent to Jones' Infowars media page and West’s personal site. Gilmore, who was on leave from the Foreign Service, was in Charlottesville last August when a group of white supremacists, neo-Nazis and other far right groups gathered in the historic city to protest the proposed removal of Confederate monuments. 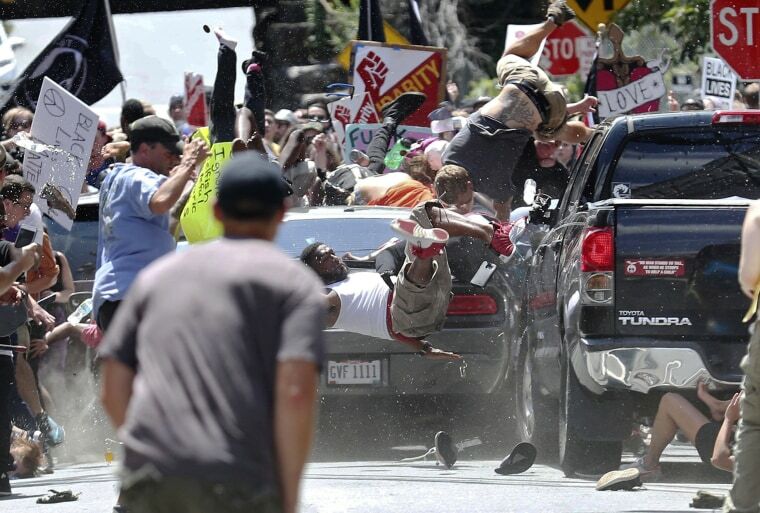 It turned deadly when police say James Alex Fields Jr. of Ohio drove his Dodge Challenger directly into a group of counterprotesters, killing one woman and injuring 19 others. “It was very clearly intentional," Gilmore told NBC News afterward. "From the far end of the street it accelerated, slowed down right before the crowd and then slammed on the gas through the crowd sending bodies flying. And then it reversed back into the street dragging bodies and clothes." Gilmore posted his video on Twitter and it immediately went viral. But after that, Gilmore became the target of “an overwhelming volume of hate mail and death threats, hacking attempts and even in-person harassment on the streets of Charlottesville,” the complaint states. Gilmore, in the complaint, said his parents’ addresses were published online and an unknown powdery substance was sent to their home. “To this day, Brennan suffers the effects of this character assassination: His career as a diplomat has been compromised, he has lost potential partners and clients in his most recent business venture, and his social relationships have been irreversibly damaged,” the complaint states. Also named in the suit are various Infowars "reporters" and other right-wing bloggers, including West, who called the Charlottesville attack a "setup." Gilmore is seeking unspecified damages for his “reputational injuries and emotional distress, as well as punitive damages to deter the defendants, and others like them, from visiting such harm on other private citizens in the future,” according to a statement from his lawyers.